Maeva! Welcome to French Polynesia — the beautiful islands of Tahiti. Ia Orana (pronounced yo-rah-na) means Hello in Tahitian. Tahiti is only one of the 118 islands and atolls that make up French Polynesia. Tahiti, Moorea and Bora Bora are the most well known islands within the chain. 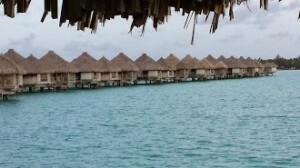 When honeymooners and clients tell us that they want to go to Tahiti, we know that they are actually dreaming of the over water bungalows that were made so popular on the island of Bora Bora. Tahiti is made of two volcanic mountain ranges and is actually 2 connected islands In the shape of a turtle. 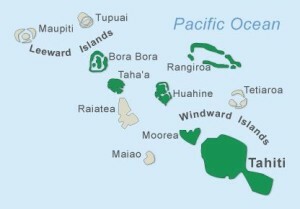 Tahiti Nui is the the larger part, where the majority of the people live and work. Tahiti Nui is the part of the island where the airport and hotels and resorts are located. Tahiti Iti is the smaller of the islands and is mostly agricultural. There are some great surfing beaches on Tahiti Iti, located near the village of Teahupoo. The two islands are linked by the isthmus of Taravao and surrounded by black sand beaches. Tahiti is the main shopping hub of French Polynesia and if you are staying in Tahiti for a couple of days, a visit to Le Marche, the public market is a must. It’s the perfect place to find everything imaginable from all the islands. Open daily until 4 or 5pm, the market is especially colorful and lively on Sunday mornings when locals shop. It’s located just two blocks from the waterfront and easily reached by Le Truck or by taxi from your resort. The lower level is mainly food items and gift items. The upstairs level is where you’ll find some jewelry stores featuring the famous Tahitian Black Pearls. With over 70 miles of coastline, a circle island tour is a favorite with stops at scenic overlooks, waterfalls, gardens and ancient sites. The Gaugin Museum, dedicated to Paul Gaugin’s life, is located on Tahiti, as well as the Pearl Museum. Take a trip into the lush and jungle like interior of Tahiti Nui by 4×4 safari tour, helicopter or by a guided hiking tour. The interior of Tahiti Nui is an unspoiled world of towering waterfalls, deep flower-filled valleys, large lakes, and colossal green peaks rising over one mile above the valley floor. Play a round of golf on one of the 2 golf courses in French Polynesia. Just a 7 minute flight or a 35 minute high speed ferry ride away from Tahiti Nui, Moorea is a lush and tropical island known as the Magical Island. You can see the island from the west coast of Tahiti. This island is postcard worthy with eight mountain ridges that tumble down into the wide turquoise lagoon which surrounds the island. 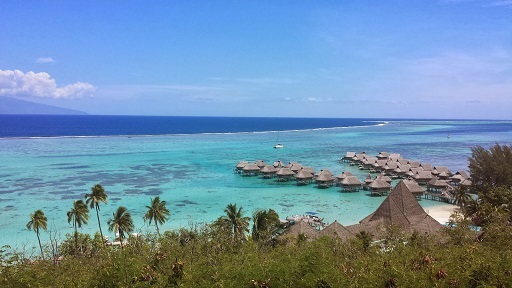 What is there to see and do in Moorea? Belvedere Lookout is probably the most famous stop in Moorea where you can get fabulous views of Mt. Rotui, Cook’s Bay and Opunohu Bay. There are also the ruins of an ancient temple, tons of wild chickens and beautiful flowers along the road. The best way to visit the Belvedere Lookout is by ATV tour, circle island tour or on a guided hiking tour. Snorkeling is popular in Moorea’s lagoons. The channel between the Fareone and Tiahura Motus are particularly nice. There are also snorkeling tours that can combine snorkeling with shark and sting ray feedings and a motu picnic. For a Tahitian show, visit Tiki Village for their dinner show. You’ll be entertained by a 60 dancers, singers and musicians. It also includes a replica of a traditional Tahitian village. Swimming with Dolphins is located at the Intercontinental Moorea resort. There are a number of different dolphin encounters including a Meet and Greet, the Apnea Encounter and the Trainer for a Day encounter. The 2nd golf course is located on Moorea and was designed by Jack Nicholas. Nearby the airport, you can get a good view of the golf course when you fly in or out of Moorea. Paopao & Opunohu Valley tours. Shopping at Le Petit Village and island boutiques and art galleries. Lagoon explorations by boat, jetski, pedal boat, kayak, or parasail. Circle-island self drive to explore villages, shops, and ancient sites. Guided hiking trips to mountain overlooks and waterfalls. Simply put, Bora Bora may be the most beautiful island in the world. Less than a 1 hour flight from Tahiti or Moorea, the island of Bora Bora has a lagoon that completely surrounds the main island. Lush tropical valleys comprise the interior of the island, where Mt. Otemanu stands majestically, while palm-covered motus sit in the lagoon that surrounds the island. Gorgeous white sand beaches lead out to turquoise waters where colored fish dart in and out of the the coral gardens. Bora Bora can be described as the center of romance, where luxury resorts dot the island with over water bungalows, thatched roof villas, serene spas and infinity pools. Bora Bora is the home to the first over water bungalows in the world. What is there to see and do in Bora Bora? Aside from water sports, Bora Bora has the remnants of World War II cannons and a few archeological Polynesian relics. These can all be seen on an 4×4 tour. You can horseback ride along the motus. You can hike up to the summit of Mt. Pahia. You can have dinner at Bloody Mary’s, which is a sandy floor restaurant made famous by the celebrities who have visited. You can rent Jet Skis, take a sunset cruise, take a helicopter tour, shop for handicrafts and pearls, learn to dive. Take a submarine dive so you can see the gorgeous coral reefs without getting wet. Whatever you do in Bora Bora, take some time to relax and enjoy the resort because most are spectacular and will offer once in a lifetime experiences. Where is Tahiti located?– The Tahitian islands are located 1/2 way between California and Australia. They are in the same time zone as Hawaii (so 3 hours behind Pacific Central Time during daylight savings time). How can you get to Tahiti? Just an 8 hour flight from Los Angeles, Tahiti is just a couple of hours further than to Hawaii. The main airline flying to Tahiti from Los Angeles is Air Tahiti Nui but you can fly on Hawaiian Airlines from Honolulu, Air New Zealand and more. The international airport is Fa’a International Airport on the island of Tahiti. The airport code is PPT (for Papeete). In order to get to the other islands like Moorea, Bora Bora, Raiatea, Rangoria, Huahine and more, you will need to fly or take a ferry. The flight from Tahiti to Moorea is a 7 minute flight (or 35 minutes by fast ferry). The flight from Tahiti to Bora Bora is about 45 minutes. 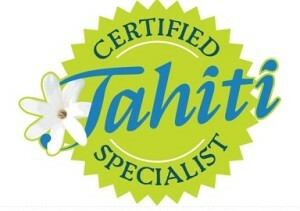 What documentation is needed for Tahiti? If you are a U.S., or Canadian citizen, all you need is a valid passport and you can stay for up to 90 days without a visa. Please check your passport to make sure it is valid for at least 6 months past your date of return. What language is spoken in Tahiti? Tahitian and French are the main languages but English is widely spoken as well. What is the weather in Tahiti? Tahiti has 2 seasons. Winter is from May through October, when the climate is ideal. Summer is November through April and it’s slightly warmer and more humid. This is also known as the rainy season so you can expect showers during these months. The average year round temperature is 79 degrees F. French Polynesia is blessed with lots of sunshine and enough rain to keep the waterfalls flowing and the flowers blooming. The ocean temperature is about 80 degrees F year round (79 in the winter and 84 in the summer). My Vacation Lady was in Tahiti in early December and it rained for 1 evening of our 9 day stay with bright sunshine the rest of the time. What money is used in Tahiti? The Tahitian currency is the French Pacific Franc (XPF or CFP). The value is about 80-90 cents of XPF per US dollar. Rates can vary and you can convert currency at the airport before you leave home, at ATM machines located at banks throughout the islands or at the hotels. Major credit card are accepted at most resorts, shops and restaurants but some smaller restaurants and vendors may only accept Francs. What about tipping? Tipping is not customary in French Polynesia but a tip for excellent service is certainly appreciated. What about electricity? Tahiti uses 220 volts vs. 110 volts for the U.S. and Canada so you will need an electrical adapter for most of your electronics. If you are using any appliances with a heating element, such as hair dryers or hair straighteners, you will also need a converter. Many hotels will have a 110 volt outlet but with all of the electronics that most of us travel with, please bring one or 2 with you. The adapter is the same that is used in Europe. What should you bring with you to Tahiti? Tahiti is casual so leave your suits and dress clothes at home. Since you are in the tropics, lightweight and comfortable clothing is best. For during the day, swim suits and cover ups or shorts and tee shirts are fine. At night, a sundress, capris or shorts (for women) and cotton slacks or nicer and a cool collared shirt are fine for men. A pareo is the Tahitian word for a wrap around skirt. This colorful piece of fabric is great as a skirt or bathing suit cover up. In Tahiti, it’s common for women to walk around with the island’s national flower, the tiare, behind their ear. But, the placement of the flower is very interesting. Placing the flower behind the left ear means you are taken, and behind the right ear means you are available. As a Tahiti Tiare specialist, My Vacation Lady can help plan your dream honeymoon or vacation to French Polynesia. We take the personal approach to vacation and honeymoon planning. 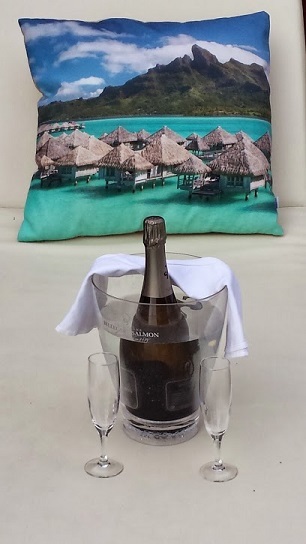 Contact Us, so that we can share our experience with you and help your honeymoon or vacation to Tahiti be everything you dreamed it would be.